Even after the final checklist is revealed, collectors can still find unexpected things in card products, especially in big releases. This is exactly what happened with 2013-14 Prizm Basketball. Only in its second year, Prizm Basketball has emerged as one of the top mid-level offerings in the Panini arsenal. Soon after the Prizm release, unsigned Damian Lillard cards from 2012-13 products began to surface in these 2013-14 packs, leading to questions. Was it a QC error? Were these leftover cards from the original printing? Damian Lillard was involved in one of the more controversial aspects of the 2012-13 season. Although he was the NBA Rookie of the Year and one of top options for basketball collectors, Lillard signed an exclusive deal with Leaf, so none of his signed cards could appear in Panini products. Since Panini has the only NBA license for cards, this complicated things for collectors who wanted signed Lillard cards in his Portland Trail Blazers jersey. 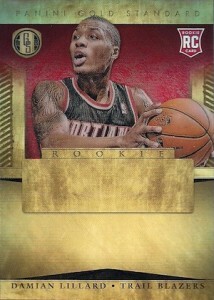 Eventually, Panini and Leaf reached an agreement, and Lillard was included in several late 2012-13 Panini products. Later, Panini announced a redemption program that would allow collectors to obtain signed Damian Lillard cards featuring the designs from early 2012-13 products. At this point, we know a few things about these mystery inserts. First, the design is virtually identical to signed cards that were included in the 2012-13 products and those included in the Damian Lillard redemption program. The obvious difference is that these inserts are not signed and do not contain any memorabilia. Also, the cards are not numbered like their signed redemption counterparts. The only other noticeable difference is the red "RC" logo, which was not present on the original design, but can be found on the un-signed inserts and the signed redemption cards. While more versions may still be out there, the only verified Damian Lillard cards feature the 2012-13 Gold Standard and 2012-13 Select designs. And although the print run is currently unknown, both appear to be quite rare. The actual signed Damian Lillard redemption cards, featuring the same design, can be seen here, and the inserts found in 2013-14 Prizm can be seen below. Lillard Rookie Year 2012-13 Elite Series Basketball Elite GlasS HOT!!! Are there any updates on this? My son has a Panini Select Lillard that has a place for the auto and jersey, but nothing is there. Will Panini honor this in any way and offer a replacement or something? Suggestions? I just pulled the Gold Standard out of a retail pack of 13-14 Prizm. It looks exactly the same as the image above except the RC logo is not red, it is gold and blends in with the overall color and is hard to read. How much do you think this card is worth? I now have 3 of the first car pictured- both the “refractor” red “RC” version and two of the non “refractor” versions. Does anyone have advice on what I should do with these cards? I purchased them all over The last few months. I considered sending them off to be graded but I’m not so sure that’s a good idea considering how scarce they are. 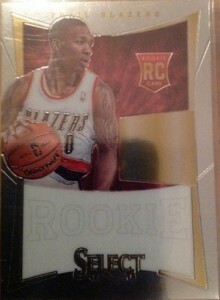 I just pulled one of the Lillard RC, it says 12-13 Panini Select but it has no Jersey and no Autograph. I got it in a 13-14 package. How rare is it and is Panini going to offer this as some kind of redemption card?